Computex 2018 will take place in Taipei from 5th – 9th June 2018. PNY Technologies will showcase several new products at the Grand Hyatt Hotel, including the PNY microSD Elite 512GB card. This microSDXC card will offer a powerful solution for users looking for expanded storage capacity and fast transfer speed. 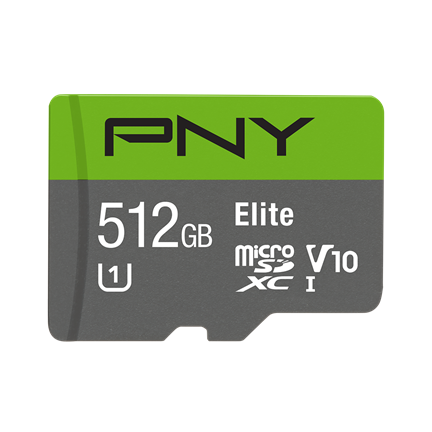 London (UK), 24th May, 2018 – PNY Technologies, a global consumer electronics and data storage technology leader, announced today the expansion of its microSDXC card line-up by introducing the PNY Elite 512GB microSDXC™ card. The card’s 512GB capacity is the highest available in the market today. The development of such capacity is needed due to today’s demand for expanded storage, whether for videos, high-resolution images, or music and document storage. Ideal for Android™ smartphone and tablet users, drones, action cameras, dash cameras and more, the world’s highest-capacity card can hold up to 80 hours of Full HD video content1 or over 100,000 photos2. PNY Elite 512GB microSDXC card is rated U1 and performs at up to 90MB/s transfer speed3. Sean Parker, a PNY Photo ambassador, commented: “In my field of work, I often find myself in extreme environment conditions! I need to make sure I am prepared and ready to capture the moment regardless of these external conditions. The PNY Elite 512GB microSDXC card brings me this confidence, knowing that I can record over 80 hours of Full HD video, transfer over 100,000 photos at speeds of up to 90MB/s. PNY Elite 512GB microSD card is my memory card of choice as I know that I will not ‘miss the moment’”. Find the new microSDXC Elite 512GB on pny.com. 1GB = 1 billion bytes. User-available storage may be less than total listed. 1Based on data-rate of 13Mbps. 2Based on 18MP estimated at 4.7MB file size. Results may vary based on host device, user settings, file attributes and other factors. 3Up to 90MB/s read speed, write speed is lower. Based on PNY internal testing; performance may be lower depending on the host devices and user’s settings and configurations. ©2018 PNY Technologies Inc. All rights reserved. PNY, PNY logo, and PNY Elite are registered trademarks or trademarks of PNY Technologies Inc in the U.S. and/or other countries. Android is a trademark of Google Inc. All other marks are the property of their respective owners. Established in 1985, PNY Technologies®, Inc. celebrates over 30 years of business excellence as a leading manufacturer and supplier of Flash memory cards, USB Flash drives, solid state drives, cables, computer memory upgrade modules, NVIDIA® GeForce® consumer graphics cards and NVIDIA® Quadro® professional graphics cards. The company’s Photography-Videography, Mobility, 3D Gaming-Visualisation and Business solutions are widely available from major retail, e-tail and wholesale outlets internationally. Headquartered in the USA, PNY maintains facilities in North America, Europe, Middle East, Asia and Latin America. Kingston Technology has rrefreshed its range of UHS-1 U3 MicroSD Gold-series memory cards. Samsung has announced an EVO Plus 256GB microSD card, which the company says is the largest capacity microSD card in its class.